Over at A2Z our theme is about getting to know you- Use your favorite Hero Art items. I chose to use my favorite two embossing powders ( I couldn't chose 1) and since we have a lot of pregnant ladies at church this year, I did a baby themed card. I first stamped and heat embossed my sentiment on some watercolor cardstock. Then I followed the same step for the baby feet up the side of the panel. Once the heat embossing was done I watercolored the panel and ran a cardstock panel through my Big Kick with an embossing folder, while it dried. I adhered the layers on the cardbase with the top layer being adhered with foam tape. Sweet baby card Monica!! 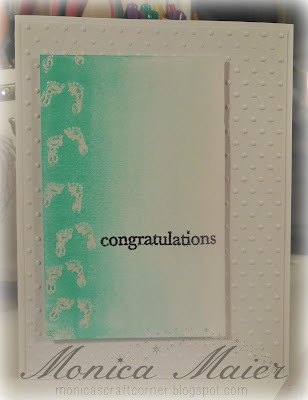 I love how you used the baby's feet stamp from the set.